The subtitle of ths truly great album, Morris Dance Tunes from Shropshire, really gives the game away. It features tunes used by Shropshire Bedlams and Martha Rhoden's Tuppenny Dish - the two Bishops Castle-based sides with which JK has been associated for the best part of a generation. Some are Trad. 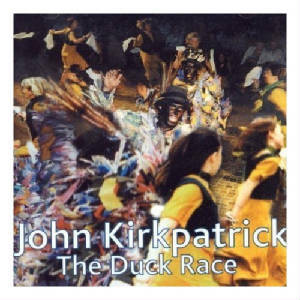 Arr., some are written by members of the two teams which of course include John and Sally Kirkpatrick. Capering, shouting and general chaos are the order of the day and in fact the title track is a dance which John invented in 1998 as a finishing off-piece. Would much of the modern interest in Morris have emerged without John's work in the album Morris On? This may be a question for future academics to debate at length. This glorious record is very far from being an academic piece, however. Rather it is a vibrant and vigorous example of the music which has been crafted over the years, and indeed continues to be written, to nurture the Morris traditions, and which, God knows, we need in this world. Morris On!